White Kyurem does bring something to the table that’s worth consideration for decks running water decks with two attacks. Field Crush can be useful if the current stadium in play is undesirable for your deck. And your Stadium card isn’t affected by this attack, only your opponent’s. Freezing Flames is White Kyurem’s biggest attack, costing WWC for 80 damage, plus 80 more damage if this Pokemon has any Fire energies attached to it. The attack cost is priced in a way where the ideal Energy attachment to this Pokémon would be either WWR or if at least one Rainbow Energy is attached to it. 160 for 3 energy is good, and backed with Choice Band and Shrine of Punishment, it’ll be a total of 200 damage against EX/GX Pokemon. As a single prize Pokémon that deals a lot of damage, it could trade prizes favorably. And it takes care of most Stage 2s out there. White Kyurem (LOT 63) swoops into the Pokemon Trading Card Game out of the Lost Thunder expansion set. This 130 HP Basic Water Pokemon has two attacks. Field Crush, for two Colorless attachments, does only thirty damage but discards your opponent’s Stadium (if your opponent has one in play). Freezing Flames does eighty base damage for two Waters and a Colorless, but if you have a Fire energy attached, that base damage doubles to 160. Throw on your Choice Band and put a Shrine into play, and you’re doing at least 200 damage. As mentioned yesterday, if you’re a single prize Pokemon that can hit for triple digit damage and that digit on the far left is a 2, you demand consideration in this new format we’re about to enter into. White Kyurem has already seen some success, and in a universe heavily populated by three prize Tag Team Pokemon, it could easily continue to maintain that success. Arceus Prism FLI has functioned well to power up White Kyurem, with Tapu Koko SM30/31 and Pheromosa FLI. When you have all those free retreaters, it helps ensure that you’ll be able to get Arceus into the active early in the game without having to worry about too many mulligans. I’ve gone 2 W 2 L with White Kyurem. It’s a cool archetype to play, it’s always a lot of fun to be able to spam energy all over the board. I preferred to use Wishful Baton instead of Choice Band so you can roll the three energy off of one KO’d Kyurem and onto another to maintain your offensive pressure. Aqua Patch, however, could help with energy acceleration if you do prefer the Choice Band option. It’s a neat archetype, but it just doesn’t quite do enough damage for me. Even with Shrine to help, it seems to fall a little short. I’m trying to find single prize Pokemon that can do something in the mid to upper 200’s so I can one shot the Tag Teams that will be coming into the format shortly. 160 is a good number, however, if you’re going up against single prize Pokemon. I think the Stage 1’s generally top out at 160, and that will OHKO a lot of Stage 2’s as well. So Kyurem is definitely worth keeping an eye on, although I can’t think of any cards off of the top of my head coming out of Tag Team this Friday that will help improve the archetype. …oh right, there are other cards to review before we get to the next set coming out. So many cards to look through, so little time before we realize we’re really going to need stuff like White Kyurem to be around for different reasons. Probably. White Kyurem is a Basic Water Pokemon, 130 HP, with a Metal Weakness, no Resistance, and a Retreat Cost of 3. Field Crush is a 2-for-30 move that discards any Stadium card your opponent has in play, but it doesn’t give you permission to stand up, slam your hands on the table, and yell out to the world that you’re crushing your opponent’s hopes and dreams. Similarly Freezing Flames is a 3-for-80 move that’s not incentive for you to torch your opponent’s cards, even if you have Fire Energy attached to increase the damage by 80. I can see White Kyurem seeing play in some decks for the Field Crush effect, especially if there are powerful Stadiums that become prominent in the game. Freezing Flames is extremely powerful, and with something like Rainbow Energy, it’s not as difficult to imagine it getting extra damage as it might seem to be initially. So overall, White Kyurem has an interesting spot to its name – the question then is on the space involved. It’s good tech I suppose. Weird to call a legendary a “tech”. Arora Notealus: Note that fusing Pokemon together that are only half of the original Pokemon you’re trying to create – rather than say, breeding them together to make one or the other – is a generally bad idea. Please note that White and Black Kyurem do not in fact fuse together to create a disjointed Kyurem or anything like that. Also don’t actually put your copies of White and Black Kyurem into a blender to see if an ULTRA KYUREM will pop out. Also don’t drink said blended cards. Next Time: He doesn’t look very much like he’s in the shell to me. White Kyurem (SM – Lost Thunder 63/214) is a [W] Type, handy for punishing [w] Weak attackers like Blacephalon-GX or utilizing [W] Type support such as Aqua Patch and Brooklet Hill; [W] Resistance and anti-[W] effects are Expanded-Only concerns, and not particularly big concerns. Being a Basic is great, making Kyurem easy to run and field whether as a single, a full four, or something in between. 130 HP is a good amount for a Basic Pokémon, just about at that point where most decks aren’t going to score rapid, reliable, repeated OHKO’s against it (two of the three, but not all three). [M] Weakness isn’t safe, but it isn’t too bad; [M] Type attackers aren’t too hard to splash in (remember Kartana-GX?) and [M] focused decks exist, but they are not common, and until recently they were most likely to be heavy-hitting decks that would have OHKO’d White Kyurem regardless of Weakness. Lack of Resistance is a shame, but not worth dwelling on. The Retreat Cost of [CCC] hurts, as not only is it large enough you should never pay it except in the direst of circumstances BUT it still a little low to take advantage of some recent support for high Retreat Cost Pokémon. 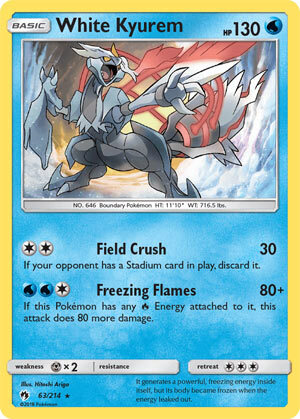 White Kyurem knows two attacks, “Field Crush” and “Freezing Flames”. Field Crush requires [CC] to do 30 damage and discard an opponent’s Stadium in play (if there is one). I can’t tell if I was wrong about Prism Star Stadium cards being potent or if we just don’t have enough of them that work well with the best decks. We’ll have a better idea once we’ve broken in SM – Team Up, I hope… but even if it turns out I was completely wrong and Prism Star Stadiums just a nice bonus for certain decks, I still like having an attacker capable of discarding Stadium cards, with an Energy cost that a Double Colorless Energy can meet. I’d rather the discard was optional and you could select your own Stadium if you wished, but since it is mandatory I’m glad it only works on the opponent’s Stadium… and see enough Stadium wars that this looks like a nice option for many decks. Freezing Flames is most definitely not a generalist attack, as it requires [WWC] to use. It does 80 damage for that price, and 80-for-three is sometimes not good enough even when prices at [CCC] but Freezing Flames has an effect: if White Kyurem has any [R] Energy attached to it, the attack does another 80 damage. 160 for what is effectively [WWR] is a great deal, as most non-Pokémon-EX/GX are going down in one hit. Some basic combos and White Kyurem can try to favorable trade many attacks which are Evolutions or Pokémon-EX/GX. I haven’t noticed White Kyurem being slipped into decks to help deal with Stadium cards, but a deck built around it actually managed a ninth-place finish in the Masters Division of the Regional Championship held at Harrogate, UK back on December 15, 2018. You can view it yourself over at Limitless. One ninth-place finish does not a top tier archetype make, but 9th out of 488 competitors is unlikely to have been only about luck. As is too often the case, I didn’t get around to building my own White Kyurem deck before reviewing, but I’m going to have to give it a try now. This could join the ranks of various “single-Prize” decks which eschew running any Pokémon-GX. I’m also not seeing anything that makes it an automatic “bad” fit for Expanded, either, so I’ll risk more speculation there; I think White Kyurem has the chops for both formats, though Expanded will naturally hold more competition and counters to it. Not as a new must-run deck, but as something you can run and win with! I also fancy it for the Limited Format; build the rest of your deck around it unless it is the only worthwhile Pokémon you pulled capable of running on [W] Energy. Though I’d prefer to have a few more examples, ninth-place at even one major Regional Championship is more than enough to prove that White Kyurem decks are competitive. Maybe not super-competitive, but enough to have a legitimate chance of winning a tournament. On top of that, I still fancy White Kyurem as potential anti-Stadium TecH. Put it all together and we get a solid scoring card.